South Africa is faced with the challenge of an insufficient small pool of skill and expertise in industries which require maths and science literacy, especially among females. According to the Department of Labour’s National Master Scarce Skills list released in April 2008, South Africa is short of around one million skilled workers, in Maths and Science related fields. 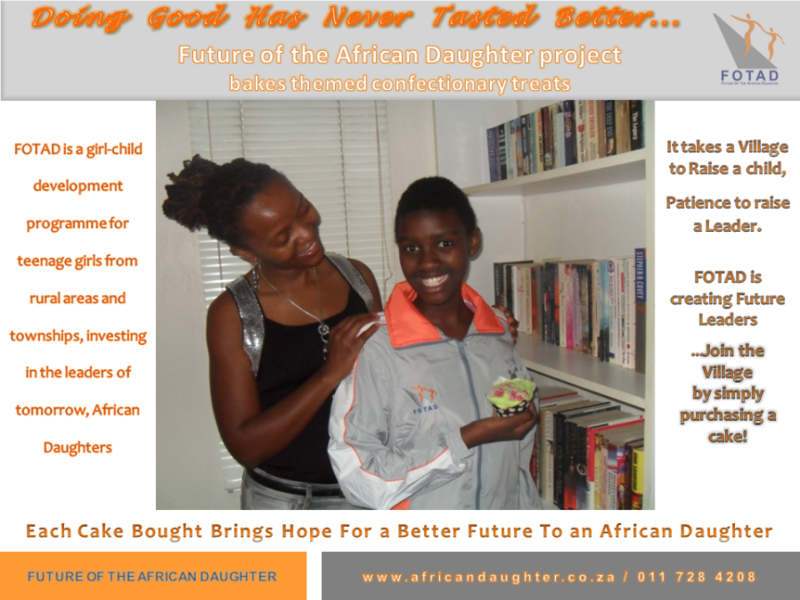 FOTAD was founded to address these and social issues faced by the African daughter. "to create a community of brilliant, independent and self-assured young women, who shall be the leaders of tomorrow and meaning participants in the South African economy." 3. To sustain the work of the project, FOTAD is selling cakes, cupcakes and baked goods, made to order and delivered to an address of choice in and around the Johannesburg area. Each cake ordered/purchased brings the possibility a better future for an African daughter a step closer.